Ashley Schafer’s training encourages balance in a horse’s movement and efficiency in its natural style. Ashley Schafer discusses how she teaches a horse to have fluid, forward motion around the barrels in part one of her two-part training series. 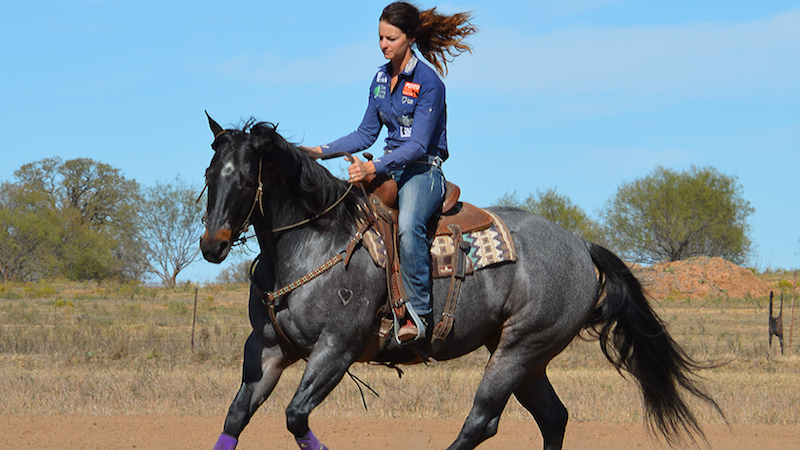 When Ashley Schafer talks about running barrels, she uses the words fluid, forward motion. For the futurity trainer, those words are more than just a catchphrase, they’re the defining principles of how she consistently makes efficient turns and fast runs on multiple horses. Like most trainers, Schafer requires a horse to have a solid foundation before she takes it to the pattern and teaches it to turn. While she doesn’t try to change a horse’s natural style of turning, she does try to enhance the turn by encouraging each horse to reach with its front feet to move fluently with forward motion throughout the turn. How she achieves that goal varies from horse to horse, but the theory remains the same—she rewards the horse with a “release” when it does what she asks it to do. To soften the ribcage, Schafer works on a circle and pulls the nose to the inside with her inside rein, pushes the ribs to the outside by placing her inside leg close to the front cinch and holds the hip into the circle by placing her outside leg near the back cinch. “Depending on the horse, my release is different but my end goal is the same— fluent, forward motion with good reach,” Schafer said. Schafer likes her horses to travel level when running barrels. This is because in cases where the horse elevates the front end or drops down in the front end, its reach and speed potential are decreased. When a horse elevates in the front end, its head will usually rise up and it will have increased knee action, or climbing. High knee action wastes energy and shortens the horse’s stride. To help a horse that wants to be high-headed, Schafer squeezes her legs to ask the horse to round its back up but positions her hands slightly lower. When the head comes down, she releases contact with the horse. On a horse that is naturally low in the front-end, Schafer squeezes her legs to round the back up and to keep the horse collected, but positions her hands slightly higher to prevent the horse from breaking at the wither. She releases the horse when their head comes up. Power comes from a horse’s hindquarters, so a horse that’s too front-endy won’t be as strong through the turns. “He won’t be strong enough behind to drive through his turns, so I need to keep his front end slightly elevated and ask him to drive forward so his hind end is engaged and his front end is pulling,” Schafer said. Horses can be naturally stiff or naturally bendy. Both body types, whether they are natural or learned, can affect the path a horse takes around the barrel turn. Schafer uses the counter arc to help both stiff and overly round horses. Too Round When a horse is too round, the shoulders do not follow the nose. The horse bends its ribcage around Schafer’s inside leg on a circle to the left. 1. The horse will give its face, but its stride in the front will become short and choppy while the hind end will sling around the barrel, making the horse lose forward motion. 2. As the horse goes into the turn, it will lock its shoulder. While its hip may not float out of the turn, the horse will become bracey, elevate its front end and lose forward motion, making it difficult for the horse to get around the turn. Horses that are stiff through their body or ribcage will usually have higher knee action when moving out. When a horse is soft in the ribcage, its hind end—the power source—will drive up underneath itself and the front end will reach forward and help pull the horse through the turn without shortening the horse’s stride. Softening the Ribcage To soften the ribcage, Schafer walks and trots small circles and asks the horse to bend around her inside leg. Schafer warns against mistaking that the horse is soft in the ribcage just because it is giving its nose. Big Circle, Small Circle can be used to encourage the horse to drive up through the turn, reach with its front end and have fluid, forward motion. This exercise is done away from the barrels. Schafer says a horse shouldn’t be taken straight from a standstill into the drill. Instead, prepare the horse for the drill by making sure it is soft and ready to work. Begin by loping a large, collected circle. The circle will be about half the size of the arena. Once the horse is balanced and soft, put them on a smaller circle. The size of the small circle will depend on the horse and should be the smallest size the horse can lope while maintaining its correct lead. For a finished horse, the small circle will be the size of a barrel turn, whereas a 2-year-old or 3-year-old will need a much larger circle. Younger horses that are still gaining strength will often crossfire—swap leads in the hind end but not the front end—if the circle is too small. If the horse crossfires, break down to the trot and ask for the correct lead again, but this time make the circle bigger. As the horse gets more trained and becomes stronger, gradually make the small circle smaller. Once the horse is loping the small circle, put your outside hand on the horn and put your body in the same position you’d take for the turn when making a run. Drive the horse forward with your legs on the small circle until you feel the horse’s inside hind leg come up underneath itself to reach and pull the body all the way through the turn. While the horse may speed up on the small circle due to the increased drive and reach, Schafer advises not mistaking a fast circle that lacks drive and reach as the correct result. Once you feel fluid, forward motion, lay your outside leg on the horse, square up your body to ask the horse to straighten up and drive out of the turn. Ride a straight line for a few strides, then stop and back up.